The new paradigm we advocate for marriage is not so new. Yet it is fresh and grounded in the spiritual life of community. It is also very African; in that it defines the ‘I’ in the ‘we’ and places the success of marriage also in the hands of the village and not just the hands of the couple. Yes, it is the couple who say ‘Amen’ to a daring promise. But, they can’t do it alone, and they shouldn’t have to. The church/village must also say ‘Amen’ to the promises made. The necessary wisdom, tenacity, and faith to live out those promises are in the community. Mutual lines of accountability between the couple and the village protect the couple from the slings and arrows of the modern world that make success in marriage fleeting. This fresh approach to marriage takes the couple out of isolation and places them in the protective custody of the village (p. 173). Without a hint from the book’s title or subtitle that African-American marriages are the central concern of Marriage on a Lampstand, a reader learns that fact in its opening pages. In the Forward, the need for a new paradigm is posited by Shawnee M. Daniels-Sykes, PhD, Associate Professor of Theology and Ethics and Mount Mary University. Ms. Daniels-Sykes observes that many contemporary couples, regardless of race or creed, find marriage “useless, meaningless, and/or confusing.” Negative influences on married life come from postmodern secular culture. She furthermore cites the “stormy and thundery history of African American couples and families in the Church and in society at large, particularly, with respect to tri-dimensional oppressions that point to race, class, and gender” (xii). Ms. Daniels-Sykes notes the complexity of the issue of African American marriage and family, and thus the steep challenges entailed in renewing a healthy marriage culture. She also hears a clarion call to the Church and the Black community. If you are Black, a parish or diocesan staff member or a marriage ministry volunteer, or simply married or care about the state of marriage, you have reason to read this book. At the very least it might alter your thinking about African-American families, race relations, or your position in any “helping” relationship. The book also has a message for our society about family support. In their book the Lykes offer what they have found to be effective strategies during their thirty-five years as Black Catholic marriage educators. Andrew and Terri Lyke are well known as presenters in national Catholic marriage and family life circles. Andrew was Director of the Office for Black Catholics and Coordinator of Marriage Ministry in the Archdiocese of Chicago. Andrew and Terri served as advisers to the U.S. Conference of Catholic Bishops’ Committee on Marriage and Family. 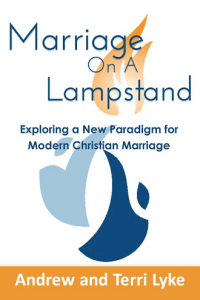 In nine chapters of Marriage on a Lampstand, the Lykes flesh out their recommendations, sharing from their experience of marriage and ministry. Every chapter ends with a thought-provoking exercise. Topics of the first two chapters fit all marriages, showing that none is perfect and that there is a difference between getting married and becoming married. Any married couple could appreciate the reflection questions ending these chapters. In the third chapter the Lykes focus their attention on Black families. They emphasize that basic Catholic beliefs about families being holy and worthy of ministry resources apply equally to African-American families. Their emphasis is impelled by statistics about the messiness of Black family life and the Lykes’ observation that parishes and dioceses have not dedicated sufficient attention to Black couple and family needs. This chapter has some enlightening discussion about race relations within the Catholic Church and the need for honest relationships as a basis for interracial dialogue. It is the Lykes’ observation that “in any situation that is potentially racist, whites tend to look for possibilities that it wasn’t ‘necessarily’ racist. If it’s possible that racism wasn’t a factor, then it probably wasn’t. On the other hand, for Blacks, evaluating the same situation, if it’s possible that racism was a factor, then it probably was” (p. 32). Interracial dialogue requires mutual respect and a commitment to truth, both qualities also essential for honest relationships. What the Lykes say about effective marriage modeling, family boundaries, and the need for community marriage support applies across American culture, without racial distinctions. Likewise their vision of a couple’s mission to put their marriage on a lampstand in service to the community must extend beyond African-American communities to all of our society. Our culture of privacy isolates the couple and the family from the larger community, an unhealthy situation that exacerbates stress. A view of the family in need of outside fixing is equally unhealthy. The healthy framework is marriage on a lampstand where, a la Matthew’s gospel (5:14–16), marriage, with all its challenges, reveals God’s creative energy and gives light to all. Chapter Four concludes with a page of practical ways a parish can set up a lampstand for marriage. The next two chapters illustrate for married couples how they can strengthen their relationships and help their marriages thrive. The Lykes spell out their P5 system: Primacy, Power, Prayer, Protection, and Purpose. Instead of reflection questions about P5, the book prompts couples to create an action plan for each element. This detailed chapter, the longest in the book, is a useful resource for couples and those who minister with them. Shifting once again, the Lykes challenge church ministers in Chapters 7 and 8, “Ministry in the Margins.” How do we serve people who don’t relate to our idioms and premises? What is the nature of our relationships with those whom we serve? Who is host and who is stranger? Who is in the margins? What do we learn on the edge? With whom can we partner? How will we implement Pope Francis’ call for accompaniment and discernment? What can we do to more compassionately accompany people of color, engaged couples, and persons ambivalent about marriage? Chapter 9 consists primarily in a detailed plan of action for strengthening marriages and revitalizing the African-American family. The plan has three phases, from incorporating a high value for marriage within the parish, through producing a marriage enrichment experience, to establishing a parish or regional marriage support system. The Lykes’ epilogue expresses gratitude for support that enabled them to say “Amen” many times in their life together. They affirm the efforts of several organizations and call for the Church to say “Amen” to God’s continuing call. Marriage on a Lampstand has a novel dynamic. It allows church professionals to listen in to advice for African-American and other couples, and it allows “non-professionals” with an intimate stake in marriage and family life, especially Black family life, to overhear ministry challenges. By going back and forth, the book tries to foster a partnership between the two. Mary Ann Paulukonis is a wife, mother, and grandmother whose life also includes artistic pursuits, writing, speaking, and ministry consulting.